Last month gave us another opportunity to catch up with our colleagues in the kitchen and bath design industry, and to share ideas and knowledge on the latest design techniques, products, and trends. The SEN Design Group Semi-Annual Conference was held in Denver April 7-10, 2015. This event brings together both kitchen and bath dealers and vendors who are members of the industry’s first and largest kitchen and bath buying group. The conference gives us a chance to participate in an array of informative workshops and panels on business, design, and sales techniques. Interacting with our fellow design professionals in these sessions helps us to stay at the forefront of our industry and bring the best service possible to our customers. The SEN conference also gives us a chance to walk through the wide range of vendor displays, where suppliers of kitchen cabinets, bathroom vanities, plumbing, tiles, flooring, and much more gather to show us the latest products they have to offer. We are excited to bring all these ideas back to our Newtown, PA showroom, and to bring the ideas and products we saw to our designs this year. Kitchen and bath design enhances your lifestyle with the perfect marriage of practical and style elements. The nature of these spaces requires very practical fixtures, appliances, storage solutions, and more, but the design decisions you make allow you to inject your personal style into the room to make a statement. Color and texture play an important role in expressing style, and this does not just include the choices you make for your wall color. The Blue Star line of ranges comes in multiple sizes to meet all of your cooking needs, but they also offer a wide array of colors so your practical cooking appliance can become a style statement by bringing a pop of color to your kitchen design. Here are some of the great colors Blue Star displayed at the SEN conference. 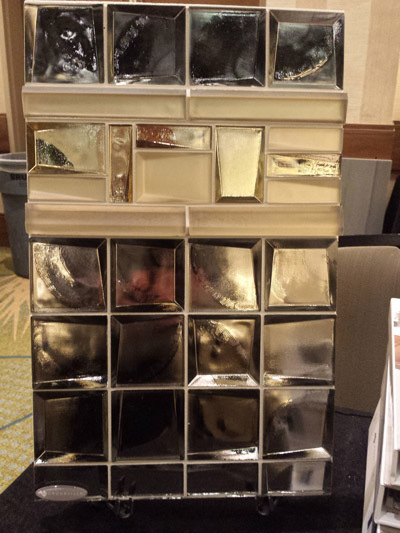 Crossville, Inc Tile presented a range of glass tile that really caught our eye at last month’s conference. These tiles pictured below left offer a beautiful marriage of color and texture that will add personality to your design. Studio L Glassworks also brings an element of texture and artistic design to a very practical, easy to maintain glass countertop. The countertop pictured below right in a bathroom design at the SEN conference is an eye catching piece that will make a statement in any kitchen or bath. Storage is critical to getting your kitchen organized, as well-planned storage means you always have a designated home for all your food, cooking, baking, and cleaning supplies. A kitchen renovation should enhance the functioning of your space by improving the layout, organization, and workspace to meet all the needs of your household. Proper storage helps you keep your main supplies at your fingertips and to avoid a cluttered mess that will ruin your workflow, not to mention the view of your beautiful kitchen design. We are always on the lookout for clever new storage solutions, and the SEN conference did not disappoint! Glideware showcased the ultimate accessories for pot and lid storage with its extendable sliding storage racks with hooks to easily store and access your pots and pans, pictured below left. Hafele presented a handy under sink pull out that will help you organize all the supplies you require to hand, pictured below right. It even includes removable baskets to make it easier to access everything and to clean the storage system. The ideas and innovative products we experienced at the SEN Design Spring 2015 conference are sure to inspire us. Contact us today to find out more.